An example of signed rock art from Wadi Ramm. Photo G.J. Corbett. 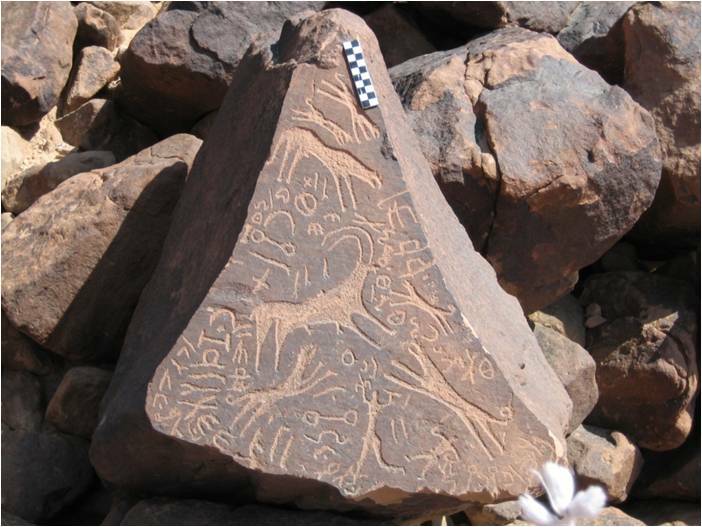 Dr. Glenn J. Corbett will speak about the 2,000 year-old Thamudic inscriptions and drawings in the area of Wadi Ramm and how contextual approaches, GIS analysis, and high-tech digital imaging are changing the way we understand these enigmatic desert carvings. Glenn J. Corbett received his Ph.D. in Near Eastern archaeology from the University of Chicago, where his research focused on the epigraphic and archaeological remains of pre-Islamic Arabia. Since 2005, he has directed the Wadi Hafir Petroglyph Survey in southern Jordan with an emphasis on using GIS and other geospatial technologies to map properly and contextualize the region’s abundant epigraphic and rock art remains. He was an NEH Research Fellow at ACOR for 2011–2012 and will begin teaching Arabian archaeology and epigraphy at the University of Ha’il, KSA, in 2014.